Advancement is about tackling the next challenge followed by searching for another. The next steps for Gray Gaulding, 16, are fairly cut and dried – battle for a NASCAR K&N Pro Series East championship in 2014 and begin the progression through NASCAR’s national series ranks. The Colonial Heights, Va., driver begins the pursuit of the former on Sunday, Feb. 16 at New Smyrna (Fla.) Speedway as part of the World Series of Asphalt Stock Car Racing. Coming off a somewhat controversial NASCAR K&N Pro Series West win last November at Phoenix International Raceway, Gaulding is ready to get down to business. In that Phoenix event, the then 15-year-old Gaulding made contact with race leader Cole Custer on the final lap and went on to claim his first NASCAR touring series victory. Last year’s K&N East champion Dylan Kwasniewski has taken his game to the NASCAR Nationwide Series leaving the title up for grabs. Just five of last season’s top 10 drivers including Gaulding are entered for the New Smyrna race. After finishing seventh in points a season ago with three top-five and eight top-10 finishes, the youngster was pleased with the effort despite not getting a K&N East win. That march will have a little different look to it in 2014. Gaulding drove a family-owned Krispy Kreme-sponsored Toyota last year in his rookie campaign. This season, he joined forces with Brennan Newberry at NTS Motorsports with the doughnut chain in tow, but now in a Chevrolet. Both Gaulding and Newberry will drive full K&N East schedules and make NASCAR Camping World Truck Series starts along the way. Gaulding stands to become the youngest driver to start a NASCAR national series race at 16 years, 1 month, 19 days on March 29 at Martinsville (Va.) Speedway. Debuts Abound: As of Feb. 10, eight drivers – Jay Beasley, Jerry Dawson, Nick Drake, David Garborauskas, Kaz Grala, Lee Pulliam, Rusty Skewes and Patrick Staropoli – are slated to make their NASCAR K&N Pro Series East debut at New Smyrna. 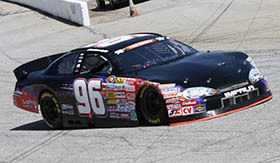 Beasley and Staropoli made K&N Pro Series West starts in 2013. Carry It Through: Finding a K&N East driver with a better second half of the season than Daniel Suárez is not an easy task. 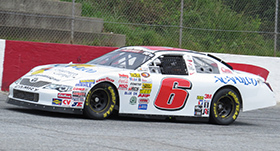 Over the final eight events of the 2013 campaign, the NASCAR Next competitor from Monterrey, Mexico scored six top-three finishes including his first series victory on July 13 at Colombus (Ohio) Motor Speedway. His average finish over the span was 4.5. Take away an 18th-place showing at Virginia International Raceway, where he succumbed to engine problems while leading the race, and the number drops to 2.57. Movin’ Up: A pair of NASCAR Whelen All-American Series standouts from a year ago are moving up the NASCAR ladder this season. Two-time and reigning national champion Lee Pulliam debuts for Hattori Racing Enterprises while The Bullring at Las Vegas Motor Speedway and Nevada state champion Jay Beasley joins the Rev Racing team this season. Pulliam joined the late Larry Phillips (5) and Philip Morris (4) as the only multi-time champions in the 32-year history of the grassroots series. Always A First: The New Smyrna 150 presented by JEGS is the inaugural NASCAR K&N Pro Series East event at the .48-mile Florida oval. It’s the only first-time track on the slate this season, but the series has made track debuts at six tracks since the start of the 2012 season including Bristol (Tenn.) Motor Speedway (2012), Five Flags Speedway (2013) in Pensacola, Fla., and Virginia International Raceway (2013) in Alton. New Horizons: After a pair of upper-echelon performances including a championship runner-up effort a season ago in the NASCAR K&N Pro Series West, Cameron Hayley moves to the K&N East and takes over the Turner Scott Motorsports ride vacated by reigning champion Dylan Kwasniewski, who moves up to the NASCAR Nationwide Series this year. Hayley, of Calgary, Alberta, Canada, made a splash with a win at the inaugural UNOH Battle At The Beach – a non-points East-West combination race – last season and followed that up with a K&N West victory at All American Speedway in Roseville, Calif. The 17-year-old NASCAR Next driver has a streak of 17 consecutive top-10 finishes in regular season West races. Casting A Wide Net: The Winter Olympics in Sochi, Russia, is not the only international event at the moment. The K&N Pro Series East event at New Smyrna Speedway has competitors from five countries – Australia, Brazil, Canada, Mexico and the U.S. – on the entry list. Nice Prize: The Sunoco NASCAR K&N Pro Series East Rookie of the Year Award has proven to be a bit of a good luck charm of late. Six of the last seven top newcomers have graduated to NASCAR national series competition. Five of them – Kyle Larson (2012), Darrell Wallace Jr. (2010), Austin Dillon (2008) and Joey Logano (2007) – already have national series victories under their belts. Alex Bowman (2011) and Ryan Truex (2009) are still looking for that initial win, but both will get several opportunities this season with BK Racing in the NASCAR Sprint Cup Series. Last year’s top K&N East rookie Jessie Little, at just 16 years of age, is back in the series running for a championship. The championship was on the line as just five points separated Dylan Kwasniewski and Brett Moffitt, but the suspense was short lived. 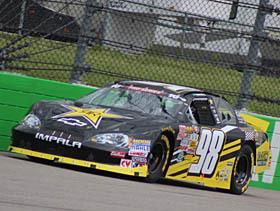 Kwasniewski dominated and Moffitt battled mechanical problems which gave the series crown to the 18-year-old out of Las Vegas. Daniel Suárez and Bryan Ortiz finished second and third, respectively. After kicking off the 2014 season in Florida, the NASCAR K&N Pro Series East migrates north for a March 15 date at Bristol (Tenn.) Motor Speedway for the PittLite 125. It will be just the third trip to the “Last Great Colosseum” for the series. The two previous events were won by Nelson Piquet Jr. (2012) and Dylan Kwasniewski (2013). Brett Moffitt finished second a year ago followed by Ryan Gifford in third. There are some changes to the 2014 K&N roster, but some big name drivers are back. (top to Bottom) Daniel Suarez is back in the six ride, Cameron Hayley takes over the Championship 98 ride, Kenzie Ruston slides over to the 96 BKR team and Gray Gaulding returns to the 20 having won last time out at Phoenix.